A fuel cell vehicle (FCV) or fuel cell electric vehicle (FCEV) is a type of electric vehicle which uses a fuel cell, instead of a battery, or in combination with a battery or supercapacitor, to power its on-board electric motor. Fuel cells in vehicles generate electricity to power the motor, generally using oxygen from the air and compressed hydrogen. Most fuel cell vehicles are classified as zero-emissions vehicles that emit only water and heat. As compared with internal combustion vehicles, hydrogen vehicles centralize pollutants at the site of the hydrogen production, where hydrogen is typically derived from reformed natural gas. Transporting and storing hydrogen may also create pollutants. Fuel cells have been used in various kinds of vehicles including forklifts, especially in indoor applications where their clean emissions are important to air quality, and in space applications. The first commercially produced hydrogen fuel cell automobiles began to be sold by Toyota and leased on a limited basis by Hyundai in 2015, with additional manufacturers planning to enter the market. As of June 2016, the Toyota Mirai is available for retail sale in Japan, California, the UK, Denmark, Germany, Belgium, and Norway. Furthermore, fuel cells are being developed and tested in buses, boats, motorcycles and bicycles, among other kinds of vehicles. As of early 2016, there was limited hydrogen infrastructure, with 23 hydrogen fueling stations for automobiles publicly available in the U.S., but more hydrogen stations are planned, particularly in California. Some public hydrogen fueling stations exist, and new stations are being planned, in Japan, Europe and elsewhere. Critics doubt whether hydrogen will be efficient or cost-effective for automobiles, as compared with other zero emission technologies. All fuel cells are made up of three parts: an electrolyte, an anode and a cathode. In principle, a hydrogen fuel cell functions like a battery, producing electricity, which can run an electric motor. Instead of requiring recharging, however, the fuel cell can be refilled with hydrogen. Different types of fuel cells include polymer electrolyte membrane (PEM) Fuel Cells, direct methanol fuel cells, phosphoric acid fuel cells, molten carbonate fuel cells, solid oxide fuel cells, reformed methanol fuel cell and Regenerative Fuel Cells. The concept of the fuel cell was first demonstrated by Humphry Davy in 1801, but the invention of the first working fuel cell is credited to William Grove, a chemist, lawyer, and physicist. Grove’s experiments with what he called a “gas voltaic battery” proved in 1842 that an electric current could be produced by the electrochemical reaction of breaking the hydrogen atom.The first modern fuel cell vehicle was a modified Allis-Chalmers farm tractor, fitted with a 15 kilowatt fuel cell, around 1959.The Cold War Space Race drove further development of fuel cell technology. Project Gemini tested fuel cells to provide electrical power during manned space missions. Fuel cell development continued with the Apollo Program. The electrical power systems in the Apollo capsules and lunar modules used alkali fuel cells. In 1966, General Motors developed the first fuel cell road vehicle, the Chevrolet Electrovan. It had a PEM fuel cell, a range of 120 miles and a top speed of 70 mph. There were only two seats, as the fuel cell stack and fuel tanks took up the rear portion of the van. Only one was built, as the project was deemed cost-prohibitive. General Electric and others continued working on PEM fuel cells in the 1970s. Fuel cell stacks were still limited principally to space applications in the 1980s, including the Space Shuttle. However, the closure of the Apollo Program sent many industry experts to private companies. By the 1990s, automobile manufacturers were interested in fuel cell applications, and demonstration vehicles were readied. In 2001, the first 700 Bar (10000 PSI) hydrogen tanks were demonstrated, reducing the size of the fuel tanks that could be used in vehicles and extending the range. There are fuel cell vehicles for all modes of transport. The most prevalent fuel cell vehicles are cars, buses, forklifts and material handling vehicles. The Honda FCX Clarity concept car was introduced in 2008 for leasing by customers in Japan and Southern California and discontinued by 2015. From 2008 to 2014, Honda leased a total of 45 FCX units in the US. Over 20 other FCEVs prototypes and demonstration cars were released in that time period, including the GM HydroGen4, and Mercedes-Benz F-Cell. Deliveries of the Toyota Mirai in California began in October 2015. The Hyundai ix35 FCEV Fuel Cell vehicle has been available for lease since 2014, when 54 units were leased. Sales of the Toyota Mirai to government and corporate customers began in Japan in December 2014. Pricing started at ¥6,700,000 (~US$57,400) before taxes and a government incentive of ¥2,000,000 (~US$19,600). Former European Parliament President Pat Cox estimated that Toyota initially would lose about $100,000 on each Mirai sold. Initially sales were not available to individual retail customers. As of December 2014, domestic orders had reached over 400 Mirais, surpassing Japan’s first-year sales target, and as a result, there was a waiting list of more than a year. At the end of 2014, Toyota planned to build 700 vehicles for global sales during 2015, 400 to be sold in Japan, 200 units in the United States and between 50 and 100 units in Europe. Deliveries to US retail customers began in California in October 2015. 57 units were delivered in October and November 2015. By May 2016, 210 Mirais had been sold in the U.S. As of June 2016, the Mirai is available for retail sales in the UK, Denmark, Germany, Belgium, and Norway. Retail deliveries of the 2017 Honda Clarity Fuel Cell began in California in December 2016. The Clarity Fuel Cell, with range of 366 mi (589 km), has the highest EPA driving range rating of any zero-emissions vehicle in the U.S., including fuel cell and battery electric vehicles. The 2017 Clarity also has the highest combined and city fuel economy ratings among all hydrogen fuel cell cars rated by the EPA, with a combined city/highway rating of 67 miles per gallon gasoline equivalent (MPGe), and 68 MPGe in city driving. The following table compares EPA’s fuel economy expressed in miles per gallon gasoline equivalent (MPGe) for the four hydrogen fuel cell vehicles rated by the EPA as of December 2016, and available only in California. Notes: One kg of hydrogen is roughly equivalent to one U.S. gallon of gasoline. to 190 mi (310 km) First fuel-cell vehicle to be approved for American roads by the Environmental Protection Agency and the California Air Resources Board, with subsequent leasing in California. Also approved for Japanese roads by Japan’s Ministry of Land, Infrastructure and Transport. Approximately 30 leased in the Los Angeles area and Tokyo. Leasing later expanded to 50 states. unknown 200 mi (320 km) Initially planned to be leased across 50 states, it was eventually only leased in California, Florida and Canada. (US$8,850) 350 km (220 mi) Leased to businesses and government entities in Japan and California. to 110 mi (180 km) 100 leased around the world. Chevrolet Equinox FC 2007-2009 Leasing only 190 mi (310 km) Leased in California and New York. and 231 mi (372 km) Leased in the United States, Europe and Japan. US$850 190 mi (310 km) Leased in southern California. US$599 265 mi (426 km) Leased in South Korea, California, Europe and Vancouver. US$58,500 312 mi (502 km) Sold and leased in Japan, California and Europe. (US$67,300) 300 mi (480 km) On sale in Japan. In June 2016, Nissan announced plans to develop fuel cell vehicles powered by ethanol rather than hydrogen. Nissan claims this technical approach would be cheaper, and that it would be easier to deploy the fueling infrastructure than a hydrogen infrastructure. The vehicle would include a tank holding a blend of water and ethanol, which is fed into an onboard reformer that splits it into hydrogen and carbon dioxide. The hydrogen is then fed into a solid oxide fuel cell. According to Nissan, the liquid fuel could be an ethanol-water blend at a 55:45 ratio. Nissan expects to commercialize its technology by 2020. 12 Fuel cell buses were deployed in the Oakland and San Francisco Bay area of California. Daimler AG, with thirty-six experimental buses powered by Ballard Power Systems fuel cells, completed a successful three-year trial, in eleven cities, in 2007. The first hydrogen fuel cell bus prototype in Brazil was deployed in São Paulo. The bus was manufactured in Caxias do Sul, and the hydrogen fuel was to be produced in São Bernardo do Campo from water through electrolysis. The program, called “Ônibus Brasileiro a Hidrogênio” (Brazilian Hydrogen Autobus), included three buses. A fuel cell forklift (also called a fuel cell lift truck or a fuel cell forklift) is a fuel cell-powered industrial forklift truck used to lift and transport materials. Most fuel cells used in forklifts are powered by PEM fuel cells. In 2013 there were over 4,000 fuel cell forklifts used in material handling in the US from which only 500 received funding from DOE (2012). Fuel cell fleets are operated by a large number of companies, including Sysco Foods, FedEx Freight, GENCO (at Wegmans, Coca-Cola, Kimberly Clark, and Whole Foods), and H-E-B Grocers. Europe demonstrated 30 fuel cell forklifts with Hylift and extended it with HyLIFT-EUROPE to 200 units, with other projects in France and Austria. Pike Research stated in 2011 that fuel-cell-powered forklifts will be the largest driver of hydrogen fuel demand by 2020. PEM fuel-cell-powered forklifts provide significant benefits over petroleum powered forklifts as they produce no local emissions. Fuel-cell forklifts can work for a full 8-hour shift on a single tank of hydrogen, can be refueled in 3 minutes and have a lifetime of 8–10 years. Fuel cell-powered forklifts are often used in refrigerated warehouses as their performance is not degraded by lower temperatures. In design the FC units are often made as drop-in replacements. In 2005 the British firm Intelligent Energy produced the first ever working hydrogen run motorcycle called the ENV (Emission Neutral Vehicle). The motorcycle holds enough fuel to run for four hours, and to travel 160 km (100 mi) in an urban area, at a top speed of 80 km/h (50 mph). In 2004 Honda developed a fuel-cell motorcycle which utilized the Honda FC Stack. There are other examples of bikes and bicycles with a hydrogen fuel cell engine. The Suzuki Burgman received “whole vehicle type” approval in the EU. The Taiwanese company APFCT conducts a live street test with 80 fuel cell scooters for Taiwans Bureau of Energy using the fueling system from Italy’s Acta SpA. Boeing researchers and industry partners throughout Europe conducted experimental flight tests in February 2008 of a manned airplane powered only by a fuel cell and lightweight batteries. The Fuel Cell Demonstrator Airplane, as it was called, used a Proton Exchange Membrane (PEM) fuel cell/lithium-ion battery hybrid system to power an electric motor, which was coupled to a conventional propeller. In 2003, the world’s first propeller driven airplane to be powered entirely by a fuel cell was flown. The fuel cell was a unique FlatStackTM stack design which allowed the fuel cell to be integrated with the aerodynamic surfaces of the plane. There have been several fuel cell powered unmanned aerial vehicles (UAV). A Horizon fuel cell UAV set the record distance flow for a small UAV in 2007. The military is especially interested in this application because of the low noise, low thermal signature and ability to attain high altitude. In 2009 the Naval Research Laboratory’s (NRL’s) Ion Tiger utilized a hydrogen-powered fuel cell and flew for 23 hours and 17 minutes. Boeing is completing tests on the Phantom Eye, a high-altitude, long endurance (HALE) to be used to conduct research and surveillance flying at 20,000 m (65,000 ft) for up to four days at a time. Fuel cells are also being used to provide auxiliary power for aircraft, replacing fossil fuel generators that were previously used to start the engines and power on board electrical needs. Fuel cells can help airplanes reduce CO2 and other pollutant emissions and noise. The Hydra fuel cell boat. The world’s first Fuel Cell Boat HYDRA used an AFC system with 6.5 kW net output. For each liter of fuel consumed, the average outboard motor produces 140 times less the hydrocarbons produced by the average modern car. Fuel cell engines have higher energy efficiencies than combustion engines, and therefore offer better range and significantly reduced emissions. Iceland has committed to converting its vast fishing fleet to use fuel cells to provide auxiliary power by 2015 and, eventually, to provide primary power in its boats. Amsterdam recently introduced its first fuel cell powered boat that ferries people around the city’s famous and beautiful canals. The first submersible application of fuel cells is the German Type 212 submarine. Each Type 212 contains nine PEM fuel cells, spread throughout the ship, providing between 30 kW and 50 kW each of electrical power. This allows the Type 212 to remain submerged longer and makes them more difficult to detect. Fuel cell powered submarines are also easier to design, manufacture, and maintain than nuclear-powered submarines. In March 2015, China South Rail Corporation (CSR) demonstrated the world’s first hydrogen fuel cell-powered tramcar at an assembly facility in Qingdao. The chief engineer of the CSR subsidiary CSR Sifang Co Ltd., Liang Jianying, said that the company is studying how to reduce the running costs of the tram. A total of 83 miles of tracks for the new vehicle have been built in seven Chinese cities. China plans to spend 200 billion yuan ($32 billion) over the next five years to increase tram tracks to more than 1,200 miles. 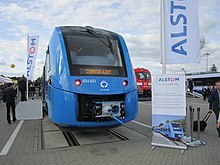 In 2016, Alstom debuted the Coradia iLint, a regional train powered by hydrogen fuel cells that will be the world’s first production hydrogen-powered trainset. The Coradia iLint will be able to reach 140 kilometres per hour (87 mph) and travel 600–800 kilometres (370–500 mi) on a full tank of hydrogen. The first Coradia iLint is expected to enter service in December 2017 on the Buxtehude–Bremervörde–Bremerhaven–Cuxhaven line in Lower Saxony, Germany. Eberle and Rittmar von Helmolt stated in 2010 that challenges remain before fuel cell cars can become competitive with other technologies and cite the lack of an extensive hydrogen infrastructure in the U.S.: As of March 2016, there were 23 publicly accessible hydrogen refueling stations in the US, 20 of which were located in California. The same year, however, Governor Jerry Brown signed AB 8, a bill to fund $20 million a year for 10 years to build up to 100 stations. In May 2014 the California Energy Commission funded $46.6 million to build 28 stations. Fuel cell vehicle is a classification in FC Hydrogen codes and standards and fuel cell codes and standards other main standards are Stationary fuel cell applications and Portable fuel cell applications. In 2003 US President George Bush proposed the Hydrogen Fuel Initiative (HFI). The HFI aimed to further develop hydrogen fuel cells and infrastructure technologies to accelerate the commercial introduction of fuel cell vehicles. By 2008, the U.S. had contributed 1 billion dollars to this project. In 2009, Steven Chu, then the US Secretary of Energy, asserted that hydrogen vehicles “will not be practical over the next 10 to 20 years”. In 2012, however, Chu stated that he saw fuel cell cars as more economically feasible as natural gas prices had fallen and hydrogen reforming technologies had improved. In June 2013 the California Energy Commission granted $18.7M for hydrogen fueling stations. In 2013 Governor Brown signed AB 8, a bill to fund $20 million a year for 10 years for up to 100 stations. In 2013 the US DOE announced up to $4 million planned for “continued development of advanced hydrogen storage systems”. On May 13, 2013 the Energy Department launched H2USA, which is focused on advancing hydrogen infrastructure in the US. By 2010, advancements in fuel cell technology had reduced the size, weight and cost of fuel cell electric vehicles. In 2010, the U.S. Department of Energy (DOE) estimated that the cost of automobile fuel cells had fallen 80% since 2002 and that such fuel cells could potentially be manufactured for $51/kW, assuming high-volume manufacturing cost savings. Fuel cell electric vehicles have been produced with “a driving range of more than 250 miles between refueling”. They can be refueled in less than 5 minutes. Deployed fuel cell buses have a 40% higher fuel economy than diesel buses. EERE’s Fuel Cell Technologies Program claims that, as of 2011, fuel cells achieved a 42 to 53% fuel cell electric vehicle efficiency at full power, and a durability of over 75,000 miles with less than 10% voltage degradation, double that achieved in 2006. In 2012, Lux Research, Inc. issued a report that concluded that “Capital cost … will limit adoption to a mere 5.9 GW” by 2030, providing “a nearly insurmountable barrier to adoption, except in niche applications”. Lux’s analysis concluded that by 2030, PEM stationary fuel cell applications will reach $1 billion, while the vehicle market, including fuel cell forklifts, will reach a total of $2 billion. The environmental impact of fuel cell vehicles depends on the primary energy with which the hydrogen was produced. Fuel cell vehicles are only environmentally benign when the hydrogen was produced with renewable energy. If this is the case fuel cell cars are cleaner and more efficient than fossil fuel cars. However, they are not as efficient as battery electric vehicles which consume much less energy. Usually a fuel cell car consumes 2.4 times more energy than a battery electric car, because electrolysis and storage of hydrogen is much less efficient than using electricity to directly load a battery. As of 2009, motor vehicles used most of the petroleum consumed in the U.S. and produced over 60% of the carbon monoxide emissions and about 20% of greenhouse gas emissions in the United States, however production of hydrogen for hydro cracking used in gasoline production chief amongst its industrial uses was responsible for approximately 10% of fleet wide greenhouse gas emissions. In contrast, a vehicle fueled with pure hydrogen emits few pollutants, producing mainly water and heat, although the production of the hydrogen would create pollutants unless the hydrogen used in the fuel cell were produced using only renewable energy. 2008 – Professor Jeremy P. Meyers, in the Electrochemical Society journal Interface wrote, “While fuel cells are efficient relative to combustion engines, they are not as efficient as batteries, due primarily to the inefficiency of the oxygen reduction reaction. … [T]hey make the most sense for operation disconnected from the grid, or when fuel can be provided continuously. For applications that require frequent and relatively rapid start-ups … where zero emissions are a requirement, as in enclosed spaces such as warehouses, and where hydrogen is considered an acceptable reactant, a [PEM fuel cell] is becoming an increasingly attractive choice [if exchanging batteries is inconvenient]”. The practical cost of fuel cells for cars will remain high, however, until production volumes incorporate economies of scale and a well-developed supply chain. Until then, costs are roughly one order of magnitude higher than DOE targets. Pure hydrogen can be industrially derived, but it takes energy. If that energy does not come from renewable sources, then fuel-cell cars are not as clean as they seem. … Another challenge is the lack of infrastructure. Gas stations need to invest in the ability to refuel hydrogen tanks before FCEVs become practical, and it’s unlikely many will do that while there are so few customers on the road today. … Compounding the lack of infrastructure is the high cost of the technology. Fuel cells are “still very, very expensive”. ^ Jump up to:a b “First Toyota Mirai delivered to Uno-X Hydrogen in Norway, with plans to harness the power of renewables for true zero-emission” (Press release). Brussels: Toyota Europe. 2016-06-20. Retrieved 2016-06-24. Jump up^ “Basics”, U.S. Department of Energy, Retrieved on: 2008-11-03. Jump up^ “What Is a Fuel Cell?”, The Online Fuel Cell Information Resource, Retrieved on: 2008-11-03. Jump up^ “Types of Fuel Cells”, U.S. Department of Energy, Retrieved on: 2008-11-03. Jump up^ John W. Fairbanks (August 30, 2004). “Engine Maturity, Efficiency, and Potential Improvements” (PDF). Diesel Engine Emission Reduction Conference Coronado, California. US Department of Energy. p. 10. Retrieved December 2, 2010. ^ Jump up to:a b Eberle, Ulrich; Mueller, Bernd; von Helmolt, Rittmar (2012-07-15). “Fuel cell electric vehicles and hydrogen infrastructure: status 2012”. Royal Society of Chemistry. Retrieved 2013-01-08. Jump up^ John Voelcker (2014-07-29). “Honda Ends Three Green Models For 2015: Insight, Fit EV, FCX Clarity”. Green Car Reports. Retrieved 2014-08-20. ^ Jump up to:a b John Voelcker (December 14, 2015). “Portable Hydrogen Fuelers Go to Six Toyota Mirai Dealers as Stations Lag”. Green Car Reports. ^ Jump up to:a b Yoko Kubota (2014-12-15). “Toyota’s Fuel-Cell Car Mirai Goes on Sale”. Japan Real Time (Wall Street Journal). Retrieved 2014-12-29. Jump up^ Ken Moritsugu (2014-11-18). “Toyota to start sales of fuel cell car next month”. Associated Press. Fox News Chicago. Retrieved November 19, 2014. Jump up^ John Voelcker (November 17, 2014). “2016 Toyota Mirai Priced at $57,500, With $499 Monthly Lease”. Green Car Reports. Retrieved December 18, 2015. ^ Jump up to:a b Millikin, Mike (2016-12-20). “Southern California customers take delivery of n>ew 2017 Honda Clarity Fuel Cell sedan”. Green Car Congress. Retrieved 2016-12-24. ^ Jump up to:a b c United States Environmental Protection Agency and U.S. Department of Energy (November 2016). “Compare Fuel Cell Vehicles”. fueleconomy.gov. Retrieved 2015-11-24. One kg of hydrogen is roughly equivalent to one U.S. gallon of gasoline. Jump up^ “Honda Clarity Fuel Cell Boasts EPA 366-Mile Range Rating, Best of Any Zero-Emission Vehicle” (Press release). Torrance, California: Honda News. 2016-10-24. Retrieved 2016-10-25. Jump up^ “Archived copy”. Archived from the original on 2016-04-08. Retrieved 2016-03-28.